A structure contains two parts one is known as superstructure and other is known as a substructure. The superstructure is above the ground or plinth level and the substructure is below the ground or plinth level. In the substructures, we provide a shallow foundation. A shallow foundation is responsible to transfer a load of the superstructure to the soil at the base of the substructure. If the bearing capacity of the soil is good and the structural load will not cause any settlement of the underlying soil layer, then you should be selected the shallow foundation. A shallow foundation is mostly used for residential building construction purposes. The function of the shallow foundation is to provide adequate support to the building structure which they carry. Foundation should imply load bearing capacity, to safely resist the effects of the various combination of the permanent and transient load transmitted to the founding strata, without any settlement and deformation. The lowest part of the superstructure in which the foundation is known as a shallow foundation. Those foundations whos depth is usually not more than about 3 meters is termed as a shallow foundation. 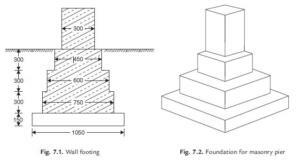 The foundation distributes the structural loads over a wide horizontal area at a shallow depth below the ground or plinth level. We provide footing only for one column is called as isolated footing. It is the most common type of foundation which is used for building construction and also called a pad foundation. 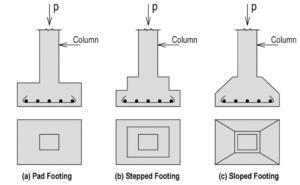 The shape of the isolated footing is usually square and rectangular. 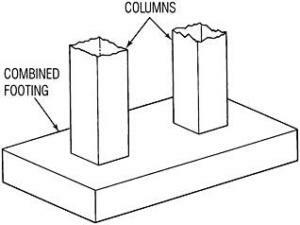 The size of the isolated footing is depending on the safe bearing capacity of soil and load on the column. Minimum 100 to 150mm thick concrete bed is provided for the isolated footing. The thickness of concrete may be uniform. In the frame structure building, a number of columns are to be built so we adopt isolated footing. This footing can be provided with both masonry and concrete footing. If the masonry footing is adopted then steps are constructed for the foundation area is thus increased the stresses developed at the base is within the limit. We use this footing when the two or more columns are close to each other. If the bearing capacity of the soil is low between the two columns then we provide combine footing. It should be in rectangular, trapezoidal or column-wall in shape. 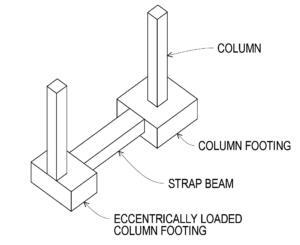 A combined footing is used when loads from superstructure are carried by the columns. Its structural design is different from isolated footing but it is a combination of isolated footing. 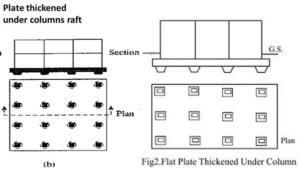 Raft foundation is also known as mat foundation. It is a continuous thick RCC slab which is resting on the soil that extends the entire footprint of the building and increases the bearing capacity of the soil. Raft foundation supports the building loads and safely transfer its load to the ground. We use it where the bearing capacity of the soil is weak and distributes loads of the whole building to the soil as compared to the individual footing. It reduces the stress on the soil. There is no difference between the raft and mat foundation both are same. The foundation and ground floor slab is pouring at the same time so which reduces our construction time and material. This foundation cannot slide during the flood. It can support heavy loads from other types of foundation. we provide it where the shallow foundation is possible but the soil condition is poor. The two columns are connected by a beam is termed as cantilever footing. It is also called strap footing. The beam in cantilever footing does not remain in contact with soil, and not transfer any pressure or stress to the soil. This type of foundation consists of a number of layers of beams usually laid at right angles to each other. 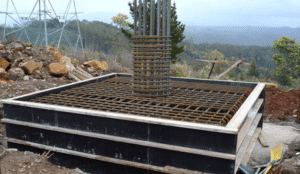 We use the Grillage foundation for high rise building and also we use to disperse heavy point loads from the superstructure to an acceptable ground bearing pressure. A spread footing is also called as footer or footing. The base is more in length than a typical load-bearing wall foundation is called spread footing. The wider base of spread footing spread the loads from the building structure over more are and provides better stability. it is the most common type of foundation and we use it widely due to its slow cost. The spread footing is mostly used to medium size structure with moderate to good soil condition. This footing supports a single centrally located column. The minimum we use M-15 concrete mix design for square spread footing. In this footing, we provide reinforcement in both axes are to resist tension loads. We provide continuous footing when two or more than two columns in a row. If the columns in a row are closer to each other the soil bearing capacity is low so that we provide continuous footing. These footings are round in plain view. This footing is suitable for the light stands, power transmission lines, and flagpoles. The construction of rectangular spread footing of a square footing with a sufficiently large base area and when large moment loads are present. We wrap this footing into a ring-like circle. Ring spread footing supports the walls above the ground level circular storage tanks. This footing is suitable for the circular water tanks. The one-way reinforced footing is only provided for the walls. In one-way footing, we provide reinforcement in the transverse direction of the wall. Only nominal reinforcement is provided in a longitudinal direction. This footing is provided for columns. In this footing, we provide reinforcement in both directions. Isolated, combined, continuous and raft foundation is an example of two-way reinforced footing. This foundation takes less time for construction as compared to others in the construction work. Shallow foundation reduces our construction time and material. No experienced labor is required to construct a shallow foundation. A shallow foundation is economical and cheaper than other types of foundation. The failure occurs due to earth quack is lesser than any other type of foundation.